It’s no secret that having kids is expensive. From diapers to college tuition, they’re an 18-year (at least!) financial commitment that seems to only get more expensive with time. In fact, studies show that, on average, a child’s needs amount to around $14,000 a year. Or, in other words, $252,000 over the course of 18 years. But what about just bringing a child into the world? From conception to childbirth, let’s break down the nine months of expenses. 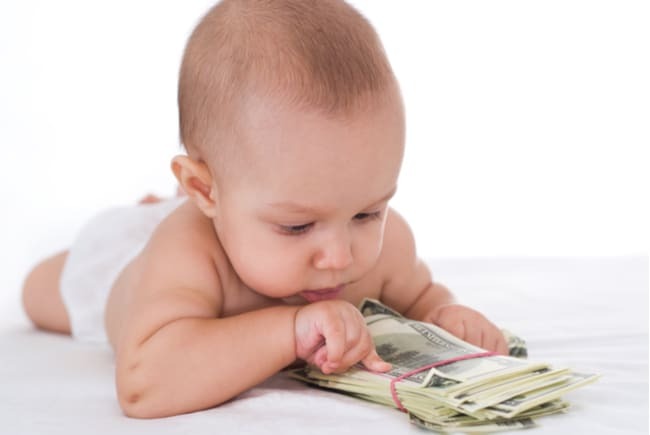 Before diving into the costs of actually having a baby, it’s important to note that the costs of having a baby aren’t limited to the birth itself. Don’t forget to take the conception and pregnancy into account, too. While conception costs can vary (some women are able to conceive naturally, while others turn to in-vitro to have a child), it’s still an expense to keep in mind. Same with prenatal care. Most insurance plans will cover a good deal of pregnancy-related visits, but if you don’t have coverage and get pregnant, the costs will climb exponentially. Now for the numbers you’ve been waiting for: how much it costs to give birth. The amounts below apply to births taking place in a traditional hospital setting, not a birthing center or a home birth with a doula. If you give birth in a hospital, here are some projected costs. Keep in mind that these costs are before health insurance coverage is applied. Depending on your health insurance coverage, it’s likely that a good amount of these costs will wind up being paid for by your provider. However, this number is very dependent on your individual plan, and can range from 20 percent coverage to 100 percent coverage. These in-hospital stay expenses can come from lab tests, epidurals, radiology scans and any additional medications that your doctor deems necessary. Also, mothers and babies receive separate hospital bills. It’s standard practice that you can’t alter, but keep it in mind going into your pregnancy to sidestep any potential surprises. Note: You will likely meet your deductible and out-of-pocket limit during this time period. All of these figures are calculated with the assumption that you have a health insurance plan and are using in-network providers (doctors that are covered under your specific healthcare plan). While there’s no surefire way to guarantee that any birth will go smoothly, staying active in prenatal care can definitely help. Not only will it increase the chances of healthy baby, but it will also pave the way for a less expensive delivery and hospital stay. Some things you can do: Make sure your health insurance covers childbirth costs, eat well, don’t drink or smoke, and talk to your OB-GYN about anything else that’s in your control to help your pregnancy go according to plan.